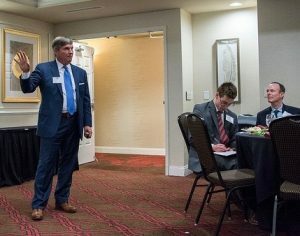 Murphy & Grantland, PA’s founding shareholder, J.R. Murphy, was invited by The Executive and Entrepreneurial Leadership Forum (EII Forum) to the University of South Carolina campus recently to offer his insights into leadership development to an elite group of campus leaders. Under his leadership, Murphy and Grantland has developed The Leadership Development Program. The program was originally created by M&G for the purpose of training their attorneys and is expanding to provide a model for both individual and organizational excellence in leadership. According to Murphy, “the most successful companies stay committed to their guiding principles, even though the methodology and business strategies may change over time.” A recent Price-Waterhouse survey suggests that purpose-driven organizations are 400% as effective as those that do not have a commitment to core values. The forum included an extended Q&A session for students, with dialogue on topics such as work-life balance, increasing practical experience through relational mentoring and the importance of serving others. In the past few years, M&G has actively practiced business mentoring with regular planned luncheons where young lawyers have the opportunity to receive both technical training and insights for personal growth. The firm continues to look for ways to improve communication and increase mentoring opportunities for the next generation of lawyers and professionals.